I make up a batch of egg salad about once a week and I have a few tried and true recipes that are my go-tos. Here’s a quick list: Dilly Egg Salad, Cream Cheese Egg Salad, Amish Tuna Egg Salad, Hammy Egg Salad, and Curried Egg Salad. 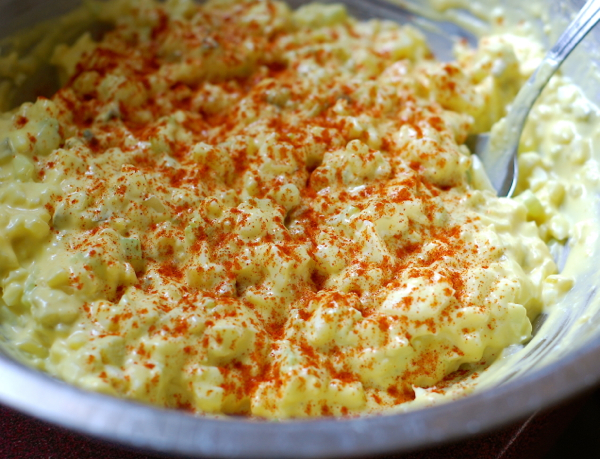 This week I made up my Deviled Egg Salad! It’s especially good in a sandwich, but I’ve served it on avocado slices and in lettuce cups when I’ve been trying to take in less carbs. You could just serve it in little bowls. It’s wonderful and tastes exactly like deviled eggs! Place completely cooled eggs in a large mixing bowl and mash, using a hand held potato masher. Set aside. In another bowl, combine: onion, celery, relish, Worcestershire sauce, sugar, mustard, garlic powder, salt, and pepper. Mix well. Add to egg mixture. Mix well. Add mayonnaise. Fold in until evenly combined. Add more or less mayonnaise depending on the consistency you prefer. I like my egg salad a little bit crunchier, so I always end up adding a bit more celery too. 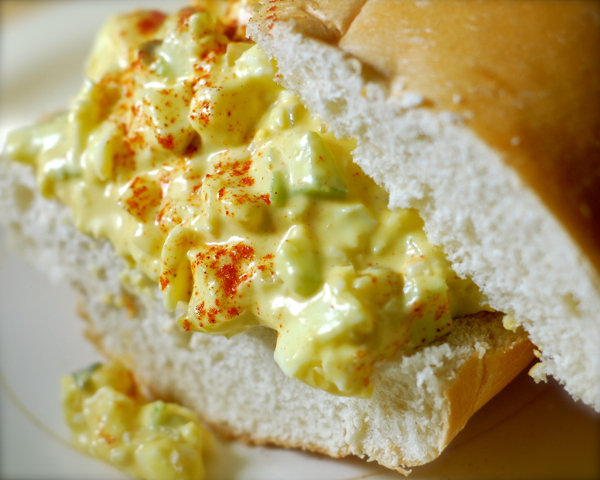 Serve Deviled Egg Salad on your favorite bread or buns. Top with a little paprika to make it pretty. No. 🙂 If you use Miracle whip, you can definitely omit the sugar.